And never more will be." 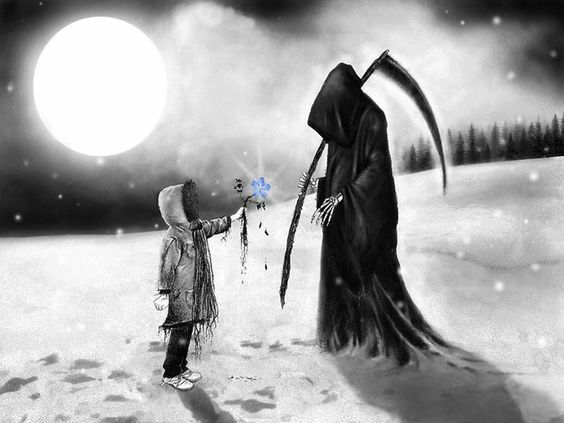 Death always comes with a bit of spirituality. Still, some sorrows are so close to the soul that wisdom can not wash them away. Post-funeral, no matter how much water we pour over our body, there is a bitter taste of ash and sand which remains at the tip of the tongue. I had first seen her when Nonu, my kid was in junior school, Five years back. That was the age when all kids look similar, similar miniature-esque walk of toy soldiers, similar eyes with bewildered happiness, running aimlessly around in the manicured school lawns, amid the quacking ducks. She was her classmate and older by few months. Quite soon she was regular at our place, her house situated close to ours. She was exceptionally talented in pencil sketches. She draw with the neatness way beyond her age. A Muslim girl, of happy countenance, she loved coming to our place every Holi and Deepavali. She would sit with us through the Lakshmi Puja every Deepavali. I would always wonder how they two, she and my kid, best friends, would grow up together. As she grew, her arrival and her departure to my place always resembled some turbulent tempest which was localized at my place. While Nonu will always be hesitant with the firecracker, she would always be the braver one, often so foolishly brave that she needed to be restrained. As is the wont of human mind, when things are well, we believe them to be eternal. But then, death arrive, dressed as innocent interruption in the business as usual. It was detected to be dengue. But then, it went bad; and later it went worse. She landed in the ICU of a prominent Private Hospital in the city. For nearly a month, she fought, always a brave soul. On the ventilator, she kept holding on to the thin thread of life. Till the day when she could not hold any longer. India, a country of a 100-billion plus souls, a population in churn, in eternal movement. Who notices a little heart which stopped beating? With dreams, undreamt; songs, unsung, she departed. The dejected father who would try to save his daughter from dust and dirt, buried her, his own hands throwing mud at the body, no longer her. I did hug him and wept in company. I did. I do not know why. Few weeks back, she had asked for Nonu to be allowed to go to her place for her Birthday. 12th of December, she would have turned Ten. Nonu remembered her and wept. I remembered the school sports day last week. A month back, she would have been planning for the event, always athletic and enthusiastic. And a month hence, she was not anywhere. On her birthday, Nonu wept. Then she was suddenly happy. I asked her why? She says- She had asked her what she wanted on her birthday? A frock, a shiny, stylish one- was what she wanted. Nonu says, now that her friend was in God's place, she could have any frock as there would be an endless supply of clothes. Nonu thinks her friend must be happy in the heaven and suddenly she is happy. My heart broke, thinking of the day, she will grow up and realize that death is a descent into darkness, into nothingness, from being to un-being. For now She is happy in the knowledge that her friend is happy with the God, and must be watching her from a distance. I tell her that death is the reason, we must value life more. We must value relationships more. We walk a thin tight rope and death is one miscalculated step. A thud, and darkness and then nothingness. I think of Nonu's friend, Suhani and I think of Rudi Steiner from The Book Thief. Only she did not have the hair the color of lemons. But she had the same zeal for life, and she also did not know as Rudi did not, as Death says in the book that- he was a month away from his death. I am sure, it Death was a person as in the Book Thief, he would have been as heart-broken at picking Suhani from our midst as he was while picking Rudi Steiner, A giver of bread and Teddy bear, a Hitler Triple Athletic Youth Champion. "I carried (him) softly through the broken street..With him I tried a little harder at comforting. I watched the contents of his soul for a moment and saw a black-painted boy calling the name Jesse Owens as he ran through an imaginary tape. I saw him hip-deep in some icy water, chasing a book, and I saw a boy lying in the bed, imagining how a kiss would taste from his glorious next door neighbor. He does something to me, that boy. Every time. It's his only detriment. He steps on my heart. He makes me cry." I am sure death would have cried this time too. I mutter the lines I wrote. From the deep darkness of the night. After a valiant and lonely fight. ..
Dust unto dust and Ashes to Ashes. (The Government tweaks the statistics on Dengue deaths in Delhi, but as we know the epidemic touches our lives, it is nothing but the worst form of lie).